The crucial thing with this dish is to use a good strong chicken stock. Cut the asparagus about 3-4 cm from the tips and roughly chop the ends, reserving the tips. Cook the chopped ends in some of the chicken stock for 5-6 minutes until soft, then remove with a slotted spoon and blend to a smooth purée in a blender. Place the chicken breasts in a wide saucepan and pour in the liquid that the asparagus has cooked in, and cover with the rest of the stock. Season, cover with a lid and simmer gently for about 6-7 minutes, then leave in the liquid. Cook the asparagus tips in boiling salted water for 3-4 minutes until tender and drain. To serve, re-heat the purée and spoon on to warmed serving plates and place the chicken on top. Toss the asparagus tips in a pan with some of the olive oil and season; then scatter over the chicken. Drizzle some more oil over. 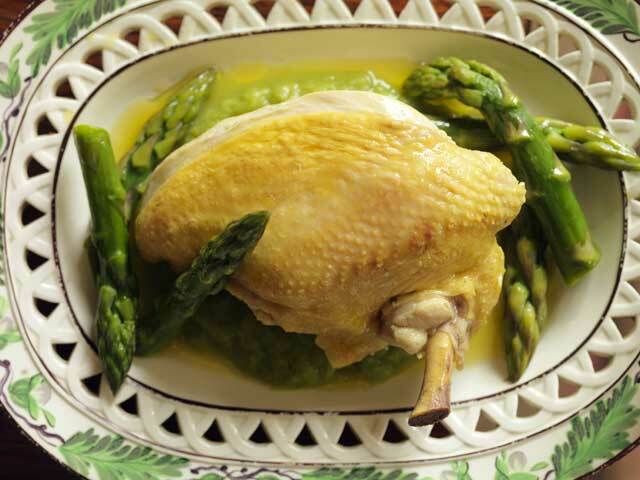 This entry was posted on May 27, 2011 at 11:49 pm and is filed under Food with tags asparagus, chicken breasts, chicken stock, free-range, freshly ground black pepper, olive oil, poached chicken, recipe, salt. You can follow any responses to this entry through the RSS 2.0 feed. You can leave a response, or trackback from your own site.